Soda for sale at a supermarket in the Port Richmond neighborhood of Philadelphia. A sticker on the shelves tells customers the items are subject to the city's sugar tax. At the same time, Philadelphians' consumption of bottled water, which is not taxed, increased. The findings are published in the American Journal of Preventive Medicine. 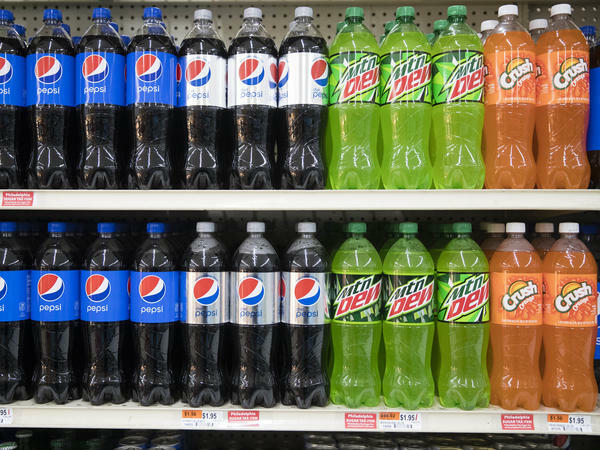 "The Philadelphia beverage tax is one of the largest beverage taxes implemented in the U.S. so far," says Yichen Zhong, the study's lead author and a doctor student in epidemiology at Drexel. She says the reduction in consumption of taxed beverages was not a surprise. But, interestingly, the tax didn't seem to influence consumption of sugary fruit drinks such as fruit flavors of Snapple or Sunny Delight. "It may have something to do with the perception of fruit beverages being healthier than sugared soda, despite the fact that they contain similar amount of added sugar," Zhong told us by email. In January 2017, Philadelphia put in place the controversial tax on sweetened drinks, including sodas and diet sodas. (Diet sodas are calorie-free, but some studies suggest they may not help people manage their weight). Public health advocates argue the tax may help encourage healthy diets and help tackle obesity and Type 2 diabetes. However, the beverage industry has been engaged in a legal battle to overturn it. An industry funded group, Ax The Bev Tax, argues that the beverage tax has shifted shopping habits to the suburbs of Philadelphia so people can avoid the tax. The industry points to a 14 percent increase in beverage sales in nearby suburbs. It's not clear whether a decline in consumption of sweetened drinks linked to the tax will lead to any measurable health benefit. "It will take much longer to observe an impact on health outcomes," says Zhong. "Many other factors, such as beverage substitutions and overall diet quality, need to be evaluated" as well. But the study does offer evidence that the tax can help nudge behaviors. Berkeley implemented a similar tax in 2015, and as we've reported, one study found consumption of sugar-sweetened beverages declined — at least in some neighborhoods — by about 20 percent. Last year, several other cities enacted beverage taxes — Albany, Calif., Oakland, Calif., and Boulder, Colo.